Spring Football Practice begins tomorrow! New Head Football Coach Neal Brown will not release a depth chart prior to Spring Practice. With that said, the following is the offensive line starter projections of Mountaineer Sports. LT Colton McKivitz (Senior) – Although McKivitz has spent most of his time as a Mountaineer at Right Tackle, a shift to Left Tackle for his Senior season makes sense. 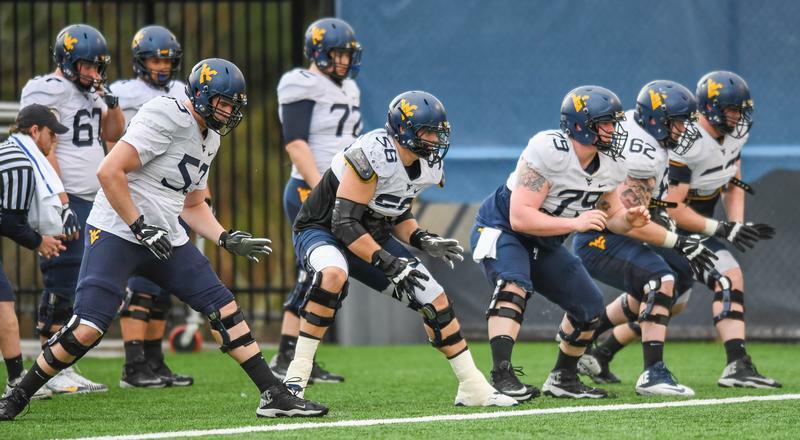 At 6’7 and 312 pounds, McKivitz is the best, most consistent offensive lineman on the WVU roster this year. McKivitz is a 2-time All-Big 12 Honorable-Mention selection, a 3-time Academic All-Big 12 2nd team selection, a 3 year starter at tackle, having played in 38 career games and starting 35. LG Josh Sills (Junior) – Sills and McKivitz, the leaders of this unit, will open up plenty of holes and gaps on the left side for the very talented WVU running back core (McKoy, Pettaway, Sinkfield, Brown) this year. Sills, a two-year starter at guard, having played in 24 career games and starting 20, was an all-Big 12 Second Team Selection last year. C Chase Behrndt (Junior) – The Center position will be the most challenging for new Offensive Lineman coach Mark Moore. With Matt Jones leaving the program and Jacob Buccigrossi injured, Chase Behrndt will have an opportunity to step in and win this position. Behrndt added depth at both tackle and guard last year, seeing action in 11 games, including 3 starts. Buccigrossi, when back from injury, and Redshirt Freshman Briason Mays will also compete for this spot. RG Michael Brown (Junior) – The Right Guard position will be another battle with several players competing for this spot, but we believe will win this position. At 6’3 and 355 pounds, Brown redshirted last year and only played in four games. However, Neal Brown has said that Michael Brown has been great during workouts and will be given every opportunity to beat out Briason Mays and Redshirt Freshman Blaine Scott. RT Kelby Wickline (Senior) – Wickline, the 6’4 and 300 pound Redshirt Senior, will provide plenty of experience to the Right Tackle position. Wickline played in 12 games last year, started two, and has added depth to the tackle position during his time at WVU. Co-Offensive Coordinator/Offensive Line Coach Matt Moore – Moore joined the football coaching staff as the Mountaineers’ co-offensive coordinator and offensive line coach in January 2019. Moore came with WVU coach Neal Brown after serving as the offensive coordinator and offensive line coach for four years at Troy (2015-18). While at Troy, four Trojan offensive linemen earned All-Sun Belt Conference honors, including left tackle Antonio Garcia, who was the highest selected offensive lineman in conference history. Garcia was selected No. 85 overall in the NFL draft by the New England Patriots. This is a big, experienced offensive line, and despite key departures, it has a chance to be really good. Last year’s offensive line paved the way for the offense to average 512.3 yards of total offense per game, ranking number 2 in the Big 12 and 8th nationally. Several of this year’s lineman were part of last year’s offense that averaged 40.3 points per game, number 2 in the Big 12 and 10th nationally.